As children grow, they become more active and test their physical boundaries to see what their bodies can accomplish. They experiment on how high they can swing and climb on rock walls, so falling is a natural part of the process. Parents in Canton and Cleveland want safety and happiness for their children, so choosing safe playground surfaces can reassure everyone in the family. When picking a playset to have installed, individuals consider every detail to determine if it is the safest one to purchase, so one should think about the outdoor playground flooring in a similar manner. Falling onto a hard, abrasive area is where most injuries occur, so SYNLawn of Northeast Ohio has developed the safest, most consistent playground surface possible. Artificial grass for playgrounds is designed for all types of equipment and protects children from falls as high as 10 feet under the accordance of IPEMA and CSA (Canadian Standards Association) playground standards. These associations lay out safety specifications on materials, installation, strength of equipment, surfacing, and more. 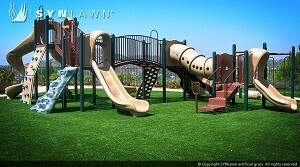 SYNLawn can assist individuals when choosing which outdoor playground flooring is best according to their situation and the playground equipment they have selected. 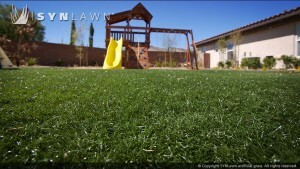 Some of the features of artificial turf products on playgrounds are the forgiving padding installed under the grass for soft landings, the gentle feel so the surface is less abrasive to fall on, the disappearance of allergies caused by natural grass, and its superior drainage rate— being ready for play even immediately after a storm. Additionally, one’s kids will not get grass stains with artificial grass for playgrounds, and high-traffic zones can be easily replaced without restoring the entire play area. Just as children like to enjoy the sunshine, adults find relaxing outdoors a soothing ending to a stressful day. Individuals living in Cuyahoga Falls, Akron, and beyond may find themselves being creative to increase their outdoor living space. SYNLawn of Northeast Ohio offers innovative solutions to construct functional areas around a home, including artificial turf products for a deck, around a pool, and on a roof. A few advantages exist when installing synthetic grass on roof decks, outdoor decks, pool areas, and patios. It is a longer lasting alternative to other materials, it requires less maintenance with no staining or weather proofing, it possesses excellent drainage, and it carries a Class 1 fire rating (on select products). Whether one is creating a rooftop garden or an entertainment area, synthetic grass for rooftop patios creates a beautiful, functional space and enhances one’s quality of life. With safety being a high priority when improving one’s outdoor living space, SYNLawn of Northeast Ohio offers many artificial turf products that meet playground and fire standards. Parents throughout Cuyahoga Falls, Ohio, and Cleveland, Ohio, can turn to SYNLawn for guidance on safe playground surface options. Their artificial grass for playgrounds meets IPEMA and CSA standards while offering many benefits, leading to healthier and happier families. Along with outdoor playground flooring, SYNLawn can help enrich one’s space in which to relax in and around Akron, Ohio, with their synthetic grass for rooftop patios, swimming pools, terraces, and decks. Their products create contentment by fashioning living and play spaces out of what was once wasted space. This entry was posted in Home Improvement, Synthetic Grass and tagged artificial grass for playgrounds Cuyahoga Falls Canton Akron Cleveland Ohio, artificial turf products Cuyahoga Falls Canton Akron Cleveland Ohio, outdoor living space Cuyahoga Falls Canton Akron Cleveland Ohio, outdoor playground flooring Cuyahoga Falls Canton Akron Cleveland Ohio, safe playground surfaces Cuyahoga Falls Canton Akron Cleveland Ohio, SYNLawn of Northeast Ohio, synthetic grass for rooftop patios Cuyahoga Falls Canton Akron Cleveland Ohio by admin. Bookmark the permalink.